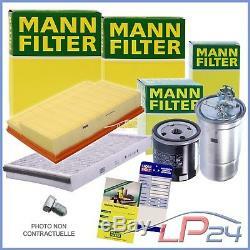 Mann-filter revision kit, filter kit "b". You will find additional information in the vehicle model table! Mann-filter overhaul kit "b" - includes: 1x mann-filter oil filter 1x mann-filter air filter 1x mann-filter activated carbon passenger compartment filter 1x mann-filter fuel filter 1x drain plug with ring sealing 1x mann-filter sticker for the inner part of the door jamb 1x liqui moly drain label. Before purchasing, please check the information shown in the vehicle model table! Please, take into account before the purchase the motor code indicated in the table! You will find an explanation of the engine code under: point 1.5 of our faq. Screw plug with sealing ring thread measurement: m 14 x 1,50 x 22 length: 29,5 mm air filter width: 136 mm height: 70 mm length: 345 mm passenger compartment filter width: 215 : 8 mm with integrated pressure regulator height: 164 mm oil filter outer diameter: 76 mm with 2 non-return valves thread measurement: m 27 x 1.5 height: 123 mm internal diameter 1: 62 mm internal diameter 2: 71 mm spray pressure overflow valve: 2.5 bar. Please note that you will receive your invoice from us in pdf format by email. For this purpose, please check your mailbox and possibly your spam folder. By saving consumables such as paper and ink / toner, valuable environmental resources will be preserved. In addition, you no longer have the effort to store, store and search your bill. Please note the restrictions indicated in the table. 11.06 - 08.12. Vehicle Equipment: for vehicles with air conditioning Vehicle Equipment: for vehicles with air conditioning. 07.08 - 08.12. 09.04 - 08.12. Engine Code: cawb, cbfa engine code: cawb, cbfa engine code: ccta, ccza engine code: ccta, ccza vehicle equipment: for vehicles with air conditioning Vehicle Equipment: for vehicles with air conditioning filter type: screw-on filter filter type: screwed filter. 04.08 - 05.13. 11.06 - 03.13. 07.08 - 03.13. 09.04 - 03.13. 06.08 - 06.14. 05.10 - 06.14. 08.06 - 06.10. Engine Code: ccza engine code: ccza filter type: screw filter filter type: screw-on filter. 06.08 - 06.10. 03.07 - 06.10. Seat altea xl (5p5, 5p8). 06.07 - 12.12. 09.09 - 12.12. 06.09 - 12.12. 01.07 - 05.09. 03.09 - 06.13. 06.07 - 04.13. 10.05 - 02.13. From construction year: 11/2008 from year of construction: 11/2008 engine code: ccza engine code: ccza vehicle equipment: for vehicles with air conditioning Vehicle equipment: for vehicles with air conditioning system type filter: screw filter type of filter: screwed filter. Skoda octavia ii combi (1z5). 03.09 - 02.13. 11.08 - 02.13. 03.08 - 05.15. 11.08 - 05.15. 05.10 - 05.15. Skoda superb ii break (3t5). 10.09 - 05.15. 11.09 - 12.17. 05.09 - 12.17. 03.06 - 08.15. Engine Code: cawb, cbfa, ccta, cc or engine code: cawb, cbfa, ccta, cc or. 11.09 - 08.15. 10.04 - 02.09. Engine Code: cawb, cbfa, ccta engine code: cawb, cbfa, ccta Vehicle Equipment: for vehicles with air conditioning Vehicle Equipment: for vehicles with air conditioning type of filter: screw filter type of filter: screw-down filter. Vw golf v estate (1k5). Vw golf vi convertible (517). Vw golf vi estate (aj5). 07.09 - 07.13. 10.05 - 10.10. Engine Code: cawb, ccta engine code: cawb, ccta Vehicle Equipment: for vehicles with air conditioning Vehicle Equipment: for vehicles with air conditioning engine code: cawb engine code: cawb. Vw jetta iv (162, 163). 05.08 - 11.09. 11.09 - 11.17. 5l liters 0w-40 a3 / b4 castrol edge fst engine oil bmw longlife-01 ### reinforced by titanium fst ###. 5l liters 5w-40 c3 castrol magnatec motor oil acea c3 ## branded product distributor pro auto parts ##. 5l liters 0w-30 castrol edge fst engine oil 0w-30 ### fully synthetic ###. Osram kit of 2 halogen bulbs h7 night breaker unlimited 64210nbu - hcb ### new model // +110% more light ###. 5l liters 10w-40 a3 / b4 castrol magnatec engine oil fiat 9.55535-g2 ## branded product distributor pro auto parts ##. 5l liters 5w-40 castrol edge fst turbo diesel engine oil API sn / cf ### reinforced by titanium fst ###. 1 liter castrol titanium fst 5w-30 c3 motor acea c3 # quality mark of the German castrol dispenser #. 1 liter castrol titanium fst 5w-30 ll motor oil acea c3 # quality mark of the German castrol dispenser #. 5 liters castrol titanium fst 5w-30 ll engine oil acea c3 # product brand distributor pro auto parts #. 5 liter castrol titanium fst 5w-30 c3 engine oil bmw longlife-04 # quality mark of the German castrol dispenser #. 5 ltr 1 liter castrol magnatec stop-start 5w-30 a5 engine oil acea a1 / b1 ## also protects engines without a start-stop system ##. 180 days guaranteed return period. Return shipping costs are the responsibility of the seller. We do not ship to areas with the following postal codes: 971xx, 97133, 97150, 972xx, 973xx, 974xx, 97500, 976xx, 986xx, 987xx, 98799, 988xx (Guadeloupe, St. Martin, Martinique, Guyana French meeting, Saint-Pierre-and-Miquelon, Mayotte, Wallis and Futuna, French Polynesia, Clipperton Island, New Caledonia). We do not ship to regions with the following postal codes: im (isle of man), gg (guernsey), i (jersey). We do not deliver to the following postcodes: im (isle of man), gg (guernsey), i (jersey). Cfad3e150 ccba7824e c2807241a c7e6b5fb6 cb4d622ac c58def9aa c93489ea9 ca78aac8a cb907abc4 c10522941 cbfdde018 c83b6d54d c919ae0ec c2ecfd6eb c4035338d cf040e691 c38ef7c39 cdc5e93a6 c7c5fc404 c53dcac2c c16cb5c0e c0e7825b4 c4f3a6cf8 c4334c9df cd64e63a2 c6e5d6b0b ce9ea41f5 c66dd939a ccc4c8059 c0b2f3813 cf9aa4fe6 c1802589a cd7782813 ce1f1c4b8 c3a6aa6c6 c107d6144 cf18c184b cb6e8b10c c4412c4a0 c4d05be8f cf3c1f3eb c51565ab5 c35433e5e c64cabbd1 ca1d70927 c01a0a7b8 ce2402b89 c602e78b3 c05a45cf4 c61297a73 c831edcb8 cadca6278 ca3df5b68 c7f98166b c9645b7e9 c22e990aa. Wide range of products for all car brands. Always more than 800,000 pieces in stock. Original new parts from all renowned manufacturers at the lowest prices. Express shipping within 1-2 business days. Secure and flexible payment possibilities. Trade register: hrb 2867; high court of weiden i. Do you still need an article? You will find it in the big world of .. the item "mann-filter kit review b seat leon 1p 1.8 tsi 2.0 cupra r tfsi 07-12" is on sale since Monday, September 17, 2018.